Although Bluetooth isn't a new technology, there has been a renewed interest in Bluetooth devices of late, with a push towards quality that's seeing some of the more established audio brands producing a wider range of wireless audio devices than ever before. That's as much a reflection of the advancement and acceptance of Bluetooth as it is that wireless headphones are in high demand across all segments of consumers. 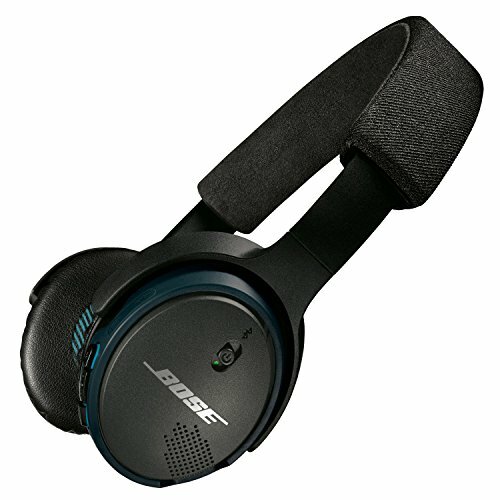 With the Bose SoundLink on-ear Bluetooth headphones, you have the first pair of wireless Bose headphones of this type, looking to bring the great performance you expect from the name, with the convenience and portability of an on-ear set. The Bose SoundLink on-ear Bluetooth headphones are well designed. The pairing of black and blue colours present on this review model is likely to be less controversial than the white paired with a sort of fleshy brown that are also available. The leather earpads are lovely and comfortable, soft enough to sit on your ears for extended periods of listening. We like the oval shape and the size, as when worn they aren't too bulky on your head and at overall 152g feels lightweight to wear. As with other on-ear headphones, there's the potential for the earpad to get a little warm against the ears, but that's a given for this format. Bose sells them as an accessory too, so if you feel you need to replace them, then you can do so. One of the inherent advantages of on-ear headphones is that you have that full headphone arrangement without the weight or bulk of an over-ear set, making it much nicer to wear in public. The headband is well padded and they are adjustable enough to get a comfortable fit across different head sizes. There are two LED backlit indicators for Bluetooth and battery status, discreetly placed on the rear, should you need to check their status. The construction of the headphones feels solid enough, with rigid plastics used for the arms and body, so they'll withstand the rigours of frequent use. That said, there's an argument that at £219 you'd want a little more than plastics: there are no exquisite design flourishes, no metal grilles or trim. But given the comfort and weight, we're happy with the construction. When not on the move, the Bose headphones also fold, making them easily portable - convenient for those travelling, or wanting to sling their headphones in a bag. There's also an accompanying semi-hard case which is nicely lined and will keep your Bose headphones safe when stored. The Bose SoundLink headphones have a physical switch to turn them on and off, which we really like. You will know when they are off, unlike some of the squishy toggle buttons you have on rival products. This switch controls Bluetooth connections too. When your headphones connect to a device, you get a voice prompt to tell you what you're connected to. If you're connected to multiple devices, then you get the list. If you ever wonder what connections you have, you can slide up and release the switch and it will literally tell you, which is really handy. This will also let you control different devices, being able to switch control from one to another. There are other buttons too, letting you change the volume as well as taking calls, pause/play/skip and so on. There's a central multifunction button (handling the play/pause functions) which, via a long press, will activate Siri on the iPhone - but not your Google Search functions on an Android device. The voice prompts are useful, not only for establishing your connection, but for telling you what's going on. The headphones ask for access to your contacts when you connect, and will then tell you who is phoning you. That means you don't have to look at your phone - simply press the button, knowing who it is. You'll also get reports on battery status when you turn them on. If you want to turn those voice prompts off, you can, as well as change the language. A pair of built-in microphones handle calls, so you can chat on the move, while the headphones attempt to balance out background noise. Callers reported that the quality was good, with no problem hearing the conversation and, although they could still detect background noise coming through, the voice remained clear on both receiving ends. We found the Bluetooth connection to be solid. Connecting both to computers and mobile devices, we've had a solid connection. If the headphones lose a connection for whatever reason (for example if a device powers off) then a voice prompt will let you know. One of the strengths of the Bose SoundLink on-ear Bluetooth headphones is the sound quality and you'd expect nothing less from Bose. They offer a well balanced sound with plenty of clarity. There are detailed high frequencies, a rich mid-range and punchy bass, handling all types of music well. Whether you're after the rippling bass of the latest club tracks, or expansive concert hall classics, the Bose on-ear Bluetooth headphones deliver them with aplomb. Bose's TriPort technology provides the natural richness of bass without the need for electronic boosting. The strong bass and dancing synth of The Thrillseekers Synaesthia is wonderfully precise, dancing from left to right with dizzying precision. At a different end of the musical spectrum, Susan Boyle's melancholy treatment of The Rolling Stones' Wild Horses, has a wonderful authenticity to the piano accompaniment with a enveloping vibrancy to the vocals. We like the punch to the bass tones that these Bose headphones produce, but they don't sacrifice other elements of the track in doing so. These headphones don't support aptX - which offers higher fidelity Bluetooth streaming - but the onboard Active EQ claims to deliver dynamic music quality close to that of Bose's wired headphones. Bluetooth isn't your only option either: there's a cable too. As soon as you plug the cable in, Bluetooth turns off so there's no confusion or wasted battery. Passive use when the battery is flat is possible, or just to avoid things like lip-sync problems (due to Bluetooth's inevitable lag) when watching movies on the go, which is a nice option. We suspect most will use these on-ear headphones principally with Bluetooth, providing around 15 hours use from the battery before a recharge is needed. That's easily achieved by plugging the provided cable into a power or USB laptop source. The SoundLink headphones don't offer active noise cancellation, but the on-ear fit does a respectable job of isolating outside noise. It won't totally isolate the outside world from hearing your music when you turn the volume up, which is something to be aware of when you're on the bus or train. The Bose SoundLink on-ear Bluetooth headphones offer a great solution for those looking for good quality headphones to use on the move. Their folding nature, lightweight and compact design make them a pleasure to tote around. Great sound performance, the assurance of a backup cable for a wired connection when the battery depletes, and a range of useful voice prompts give the Bose SoundLink headphones plenty of appeal. They are priced at £219, however, so heading towards the premium end of the range despite the use of plastics in the design. But we're sold on their lightweight and comfort when wearing for extended periods. If you're in the market for premium Bluetooth on-ear headphones, these Bose on-ears are certainly worth considering.